Another Spokane Summer Parkways will be held Sunday, August 14, 10 a.m.-2 p.m.. We’ll have a table along the route at Audobon Park with our cute stuff and I hope you’ll stop by. More importantly, though, I hope you attend the event for its own sake. Here’s why. 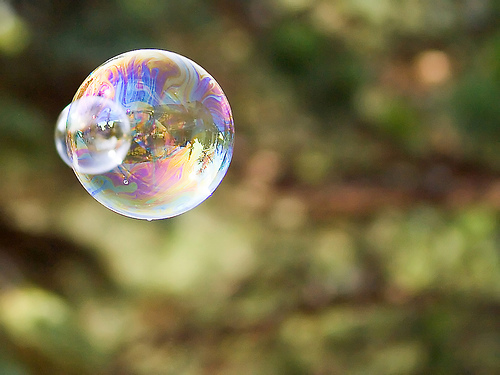 I occasionally get a sensation I refer to as “the joy bubble.” It’s a feeling of intense rising pressure from deep inside created by elation and excitement that seem to want to burst out all over. No, this is not a digestive problem. This also isn’t exactly happiness, which I feel a fair amount of the time because I’m a Sally Sunshine optimist. It feels both deeper and more significant. Walking along the sidewalk at Washington State University during one of my first years of college there, kicking through piles of gorgeous golden/orange/red/russet/brown fall leaves and looking up through more of that vivid color at a clear blue autumn sky. Learning to slalom waterski—at last—rising up behind my oldest brother’s speedboat on one ski and walking on water. Listening to my daughters sing (they have gorgeous voices). Going for a walk with my sweetheart, holding hands and striding out along the sidewalk walking in step with each other on a balmy evening or a crisp morning. And in June at Spokane Summer Parkways. The night of the first Summer Parkways, held not far from my neighborhood, I attended a late-afternoon event, then booked home in my tangerine silk dress and pumps to change into (gasp!) bike clothes for Parkways. Not half a block later another man swooped around the corner from Upper Terrace Road to drop onto Rockwood. He too called out, waved, and smiled. Any two riders on bikes encountering each other on the streets around here are apt to give a brief nod or a lift of the hand to acknowledge the two-wheeled fellowship. But the extra conviviality and connection—the smile, the comment, and two encounters so close together—felt above and beyond the norm of what I encounter in my everyday riding. I made it up the hill to Parkways and there encountered so much more of the same. Smiling, waving, talking to total strangers on one of the first truly warm summer evenings we’ve had, the day after Solstice so the light lingered. People filled the streets with happiness. Parents and grandparents pushing strollers, a mom on inline skates next to her daughter on a tiny push bike, folks of all ages and sizes on bikes of all types, a young couple walking their new adoptee from the shelter, families lined up in a semicircle of lawn chairs on their front lawns chatting, smiling, and waving at the passers-by. I pedaled slowly around the parks, stopped to chat with people I know and with ones I don’t know, told a friend who’s running for the school board that I want her yard sign, met up with my sweetheart, and went by The Scoop for ice cream before riding home together through the warm summer evening. And there it was, strong and sweet. Joy.